Congratulation to newlyweds Jackie and Trevor Frey. Jackie and Trevor were united in marriage on Saturday March,16th here at Christ Lutheran Church. May they always walk together hand in hand, while trusting in the grace of God to lead the way. Another fun night serving others was had for the youth at CLC. We spent our evening assembling homeless care packages and making plarn(plastic yarn) that will be crocheted into sleeping mats to go along with the care packages. Our goal was to make 20 care packages but because we have such amazing parents and congregation members we were able to make 30!!! A HUGE thank you to Tara Meister-Buringa for taking her evening to come in and teach us how to make plarn, to all of those who donated money or supplies for the packages and to the Younquist family for the yummy snacks! The Christmas Story as told by the Sunday School. It Just Never Gets Old !!!! were busy, busy, busy getting ready to spread some Christmas joy!! We adopted 2 families through the Kops for kids program this year. Gifts were bought with donations from youth families and shopped for by confirmation kids. and made some beautiful cards for our home bound members. A huge thank you to Jennifer Kannenberg for keeping these kids’ bellies filled while they spread holiday cheer! worship this Sunday to say THANK YOU to all of our wonderful parishioners at CLC!! Thanks to Jim Birkemeier and Tracy Thaden for delivering them for us. Pastor Kristen presents Bibles to Sunday School Students during worship service. 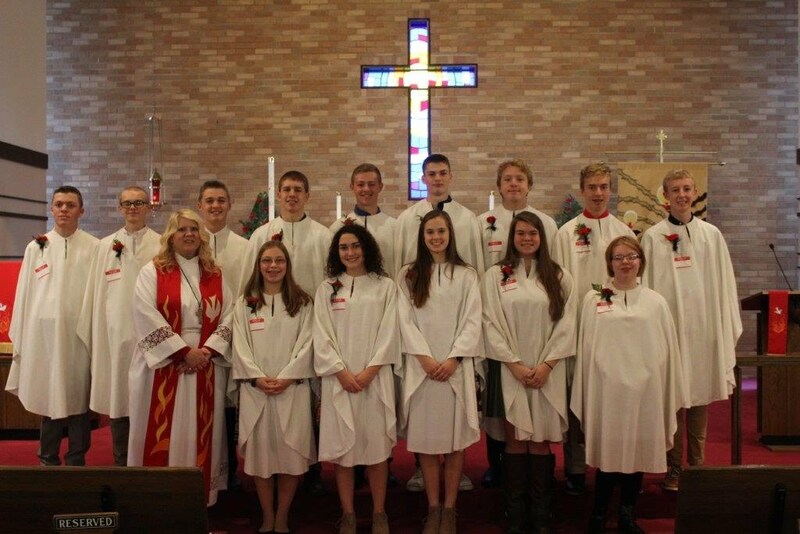 14 students were confirmed on Reformation Sunday 10/28/2018 here at CLC. We congratulate and pray for them as they take the next step in their faith journey! — with Karla Koller Amble, Heston Amble, Emily Kane, Jill Janssen Kane, Nancy Nachreiner, Clinton Kane, Kelly Roberts-Hanson, Taryn Hanson, Courtney Schaffer, Emily Kersten, Nancy Jeans Baenen, Cindy Bergman, Kennedy Kropp and Jennifer Kannenberg. with an organization called Feed My Starving Children(FMSC). nutritionally complete meals specifically formulated for malnourished children. If you would like to learn more about this organization the website is https://www.fmsc.org. CLC sponsored Cub Scout Troop 38 gets ready for Halloween with a night of pumpkin carving in the fellowship hall. 60-Plus Quilts, lovingly cut, tied and assembled by The CLC Quilters are blessed before being sent to those in need through Lutheran World Relief. From August 6th to the 10th it was a pretty amazing week at Christ Lutheran Church. 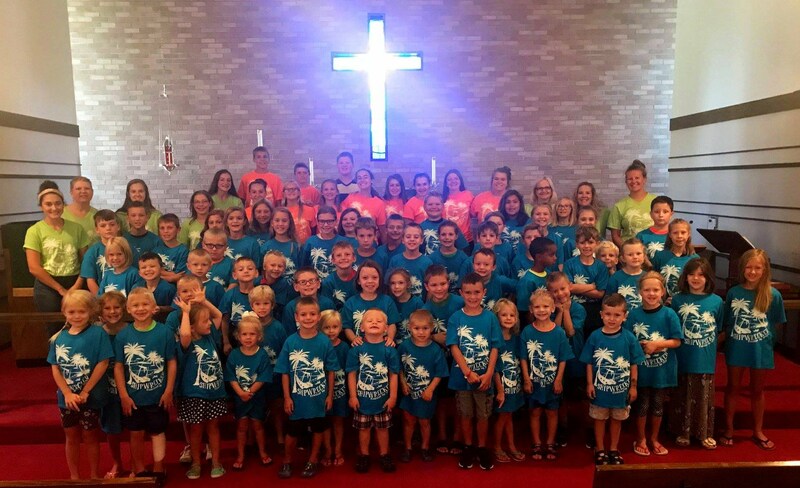 We had 61 kids attend Vacation Bible School. another group of amazing leaders who put this week all together. in Haiti so they can plant drought resistant crops to feed their families. Whether powered by gas or by your feet Pastor Kirsten performs the "Blessing of the Bikes"
7 youth along with 3 chaperones and Pastor Kirsten journeyed to the ELCA Youth Gathering in Houston. Good times filled with song, games, lectures, community service, communion, and some sightseeing. A memorable time for all. Every year CLC hosts the Sauk County Retired Teachers Luncheon. Its a great way for our church and community to give back to all those who committed their lives to teaching our young. And, its another way for members of CLC to get together and have a little fun. and she knows how to use it !!! On Saturday April 14th, CLC participated in a Mobile Food Pack with an organization called Feed My Starving Children(FMSC). nutritionally complete meals specifically formulated for malnourished children. If you would like to learnmore about this organization the website is https://www.fmsc.org. We hand packed meals from 9-11 am this day in Boscobel at the fire station. wonderful morning of service and fellowship. We filled our 40 slots with folks from all ages represented. We put together enough meals in our two hours together to feed 67 children for an entire year. "Carol, how do I cook eggs ?"